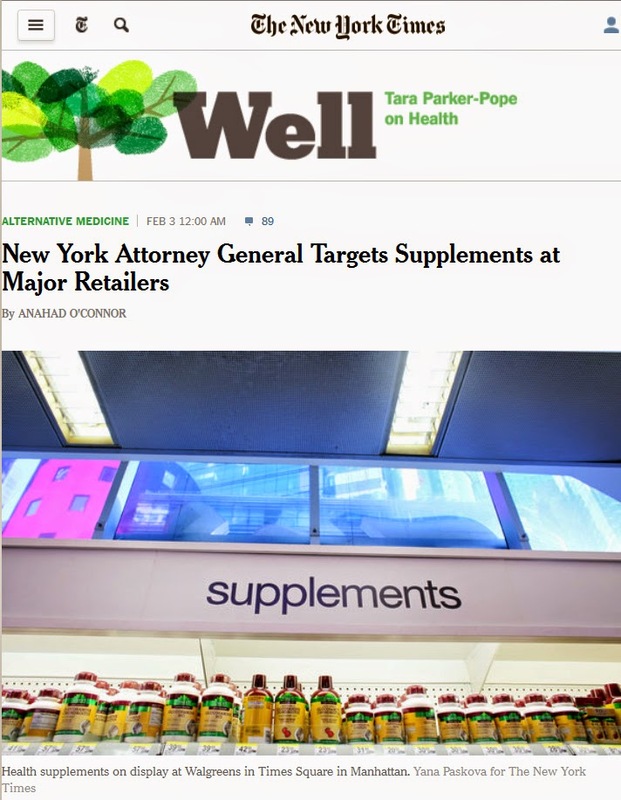 New York Attorney General has told four major US retail firms that sells herbal supplements to remove these from their shelves or they will face legal action. 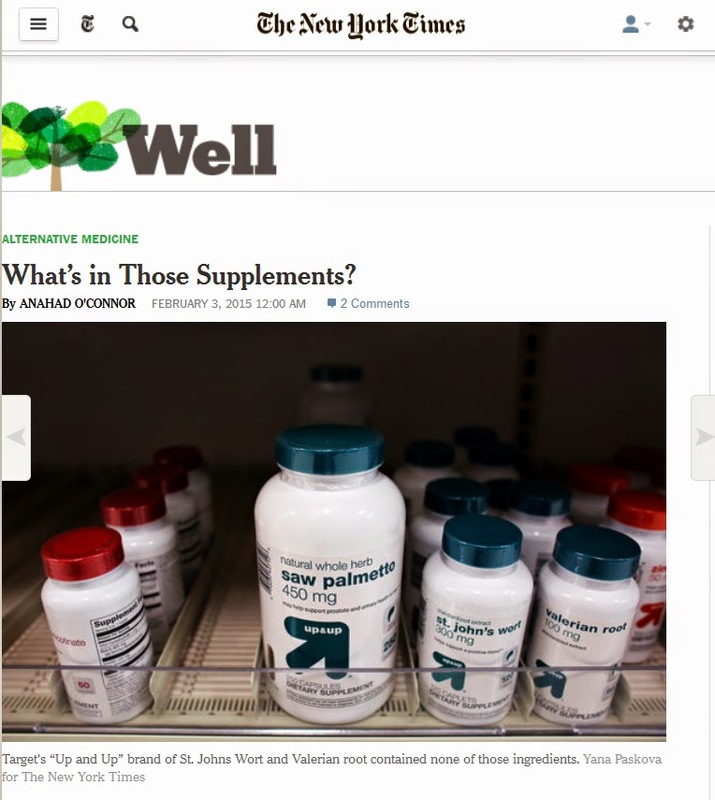 This after the AG office tested herbal supplements bought at GNC, Target, Walgreens and Walmart and found that many of the sold products did not contain what they were sold as, and in some cases, contained undisclosed 'fillers' that could cause severe allergies (such as wheat and beans, etc.). Here is the story in The New York Times this morning, and the associated article on the scientific findings. Fascinating reading, including the lack of garlic in garlic supplements, and the addition of pine shoots, asparagus, and a multitude of other plant species. It is about time. Most people are probably unaware that the quality control of herbal supplements are in the hands of the suppliers, and FDA that oversees this market has not had the legal and financial tools to follow up on potentially fraudulent cases. Scientists have been testing herbal supplements, sushi fish, and herbal teas, etc., for quite some time and often found that labels did not match the content when it comes to species. Often expensive ingredients were missing and replaced with cheaper ones. But these scientists could not take action against the companies that inadvertently or on purpose changed their product and sold the wrong ingredients. But now New York State's Attorney General took action. Hopefully this will start to clean up the herbal industry and help the suppliers that use quality-control, efficacy, and consumer safety as their main goals. Adulteration, the introduction of, or replacement with, ingredients that are not listed on the label, is a serious issue, and can be caused by poor quality control at the source of the plant material (mislabeled or misidentified plants, etc. ), and/or by on-purpose replacement of one ingredient with another without telling the consumer (often for economical reasons). This is of course both fraudulent and dangerous, since many people have allergies and need to know exactly what they add to their diet. Additionally, selling the wrong thing is a giant consumer fraud. But, keep in mind, medicinal herbal science is really based on active ingredients, and these are often particular chemical compounds. The main issues are if these sold herbal supplements contain both the correct species (the source and origin of the chemical compounds) and the active ingredients from those plants. Not enough research is done on many of the chemicals in plants and their efficacy, but plants in general are powerful natural chemical factories that produce both compounds that can both help your body and kill you. That is why it is important to know both the origin of the materials in the supplements and the concentration of active ingredients. The method used in the analysis of these supplements is DNA barcoding. It only works for supplements that still contain DNA from the original plant material, so for example bark, seeds, leaves, fruits, even in dried form. It doesn't work after you have extracted only specific chemicals from a plant. But many supplements are simply dried plant powder in capsules. 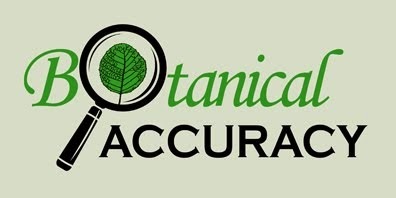 DNA barcoding means that you sequence one of several small pieces of the DNA of a plant and compare it to a big database that contains most plant species used in herbal medicine. 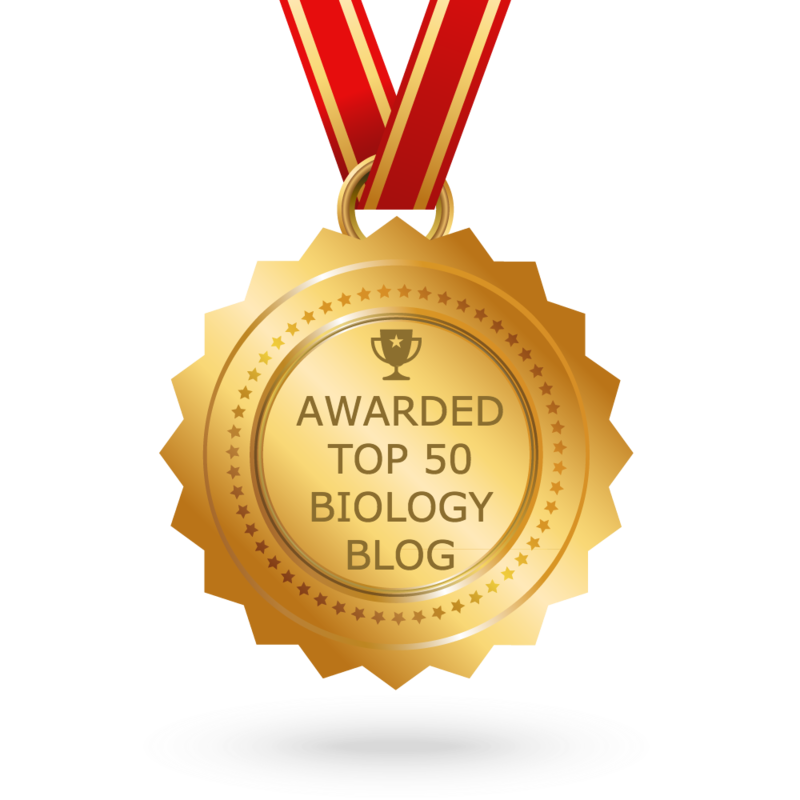 This database is growing each day as more and more sequences are added and can be analyzed. Similarly, if you know the DNA barcode of a species you are looking for, you can test and see if your supplement contains this species. DNA barcoding is not a method without some problems, but used scientifically it is the best method around to identify pulverized or dried plant materials to species. It is also used to identify unknown woods, meats, caviar, pathogenic fungi, and many other materials and organisms. The result of this DNA testing by the AG office is not a test of the value and efficacy of herbal medicine in general or for any specific herbal species. The focus here is how much adulteration of ingredients that is going on in the mass-production of herbal supplements, so it is really a test of the self-regulation of the herbal industry. The AG office of New York State is going after commercial fraud, not the scientific value of herbal medicine, which is a very different topic and maybe something for another blogpost.